Music is something that children love from an early age, and so it’s always fun to cultivate their interest with appropriate toys and gadgets. You may not have a budding X Factor winner in your family but you can have hours of fun playing at auditions! 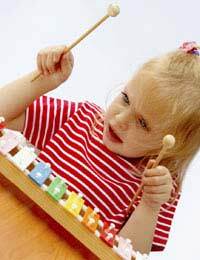 Baby’s first musical toys are usually simple play instruments like keyboards and drums. These are endlessly appealing to very young children, and they are also useful learning resources as they help to develop a child’s attention span, creative skills and motor development. Playing with musical gadgets, toys and instruments can also be really useful for teaching young children about the basics of pitch and volume, which can help them with listening and communication skills too. You can introduce your children to the idea of being a rock star at a very early age with simple imitation instruments like a Tomy guitar with infra-red strings. These toy musical instruments are suitable for kids from the age of eight upwards, and can be played with alone or with friends. On a similar note and just as popular with adults, many of the games consoles have ‘Guitar Hero’ style sets that can be either just a pseudo guitar, or in some cases come complete with a drum kit and a microphone. Great for parties and big groups of children (or adults) but perhaps not so great for the neighbours! Other musical toys and gadgets that might whet your children’s appetite for music include things like carry along keyboards for younger children, baby’s first drum kits for very brave parents, and ‘my first music centre’ which includes all sorts of interesting noises for kids up to the age of three – cymbals, bells, horns and even a microphone for the little musical genius to sing into. If your child prefers to perform rather than play a musical instrument, then the legion of karaoke sets and dancing mats that are now available will be manna from heaven for them. Starting from a young age, it’s possible to entertain parents with renditions of anything from popular chart music to Disney favourites. From the age of three, there are sing along microphones with different features like flashing lights, backing music and crowd cheering effects. Some of the microphone toys that are available also have fun things like voice changing effects which will delight and possibly slightly confuse your children, but it’s all good fun. For the dancers and entertainers, there are musical mats that you can either play ‘musical footsteps’ with and walk hop or jump on flashing lights to well known nursery rhymes – or older children will enjoy High School Musical themed dance mats featuring the songs they know from the series complete with choreographed dance routines to learn. Of course there are some times when your child wants to listen to music and you really don’t – so perfect for this is a first steps MP3 player which will introduce your little ones to the joys of solitary listening!